Christmas is a celebration which seems to be read as a licence for self-indulgence. While I’m rather old-fashioned about this tendency, I don’t think we need to go so far as to focus on Bible plants for Christmas-and even though frankincense and myrrh would warrant a column on their own, we might leave this for a later date. There are, of course, plenty of links between Christmas and adopted or fostered pagan traditions. Some ethnobotanists have suggested that Santa Claus, flying reindeer and the tradition of hanging stockings over the fireplace derive from shamanistic practices associated with the Fly-agaric (Amanita muscaria) in Siberia or, purportedly, in Lapland. The Fly-agaric is ubiquitous in children’s books as a bright red toadstool with white spots – an interesting choice for the young ones, as the Fly-agaric, apart from being generally toxic, does have hallucinogenic properties. One of the processes for reducing the toxic effects of the Fly-agaric is consuming the urine of the intoxicated reindeer or shaman. The supposed connections include the practice of drying the Fly-agarics in stockings at the fireplace, Santa’s red and white colour scheme and his mushroom collecting suit, together with the suggestion that the hallucinogenic effects on reindeer result in prancing and dancing, or alternatively the effects on the stupefied observer who can ‘see’ flying reindeer. The apotheosis of gardens and gardening remains Sissinghirst, where Vita Sackville-West created a masterpiece. However, the concept of a bleak garden is not without supporters. Derek Jarman’s bleak seaside garden in Dungeness, Kent, has been the setting for several of his films including The Garden (1990) – generally regarded as his best. This garden itself tends to be eulogised as art, As one writer commented, “Jarman realised his earth-bound paradise, an almost haphazard conglomeration of indigenous flowers, weeds, brought in vegetable and herbs, and elaborate garden sculpture made from beach detritus. A sea-tossed alchemy, if you will …”. Jarman uses his own garden as both the Garden of Eden and the Garden of Gethsemane. The Gothic garden, by contrast with both the Sissinghurst and Dungeness extremes of detailed cultivation, seems left to the overrun, forgotten, forlorn and even frightening place – the antithesis of gardening. Rose Blight perhaps pioneered Gothic garden writing. The revolting garden, published by Private Eye in 1979, provides quite a different perspective on Germaine Greer, who wrote a gardening column for Private Eye under the pseudonym Rose Blight. Here she responds to Sissinghurst’s famous White Garden with her own Black Garden. Rose Blight’s perceptive and pertinent observations of the dark side of gardening are blended with irony as she encourages the cultivation of toxic garden plants to deal with trespassing children. Indeed, Greer’s own garden (apparently) reflects Rose Blight’s horticultural knowledge and Greer’s clear abilities as a plantsperson and garden designer. We could range wider in seeking plants for Gothic gardening, seeking out not only ‘black’ foliage and flowers, but also night flowering and night fragrant plants. (The search for darker foliage and especially darker flowers seems to be a consuming Holy Grail for plant collectors and plant breeders in a range of plant groups: draw your own conclusions about these people.) However, I’ll finish with a couple of accounts of decidedly bizarre plants that seem appropriate for a mega-Gothic Garden. A must for any Gothic garden should be the Indian tiger tree reported on some interesting websites on October 23 this year. Residents of Padrame near Kokkoda in Uppinangady forest range sighted one such carnivorous tree trying to dine on a cow last Thursday. According to reports, the cow owned by Anand Gowda had been left to graze in the forests. The cow was suddenly grabbed by the branches and pulled from the ground. The terrified cowherd ran to the village, and got Gowda and a band of villagers to the carnivorous tree. Before the tree could have its meal, Anand Gowda and the villagers struck mortal blows to the branches that turned limp and the cow was rescued. Uppinangady range forest officer (RFO) Subramanya Rao said the tree was described as ‘pill mars’ (tiger tree) in native lingo. He had received many complaints about cattle returning home in the evenings without tails. On Friday, the field staff confirmed coming across a similar tree in Padrane, partially felled down. However no detailed inquiry was made as the authorities were not asked for any report, Rao said. Just put Mangalore tiger tree into your favourite search engine and you will find plenty more. And while you might be suspicious of the veracity of this account, South Australians can be proud that our own South Australian Register was among the first to carry a report of man-eating trees. On 27 October 1874 The Register carried an account by German explorer Carl Liche of a sacrifice performed by the Mkodo tribe of Madagascar. 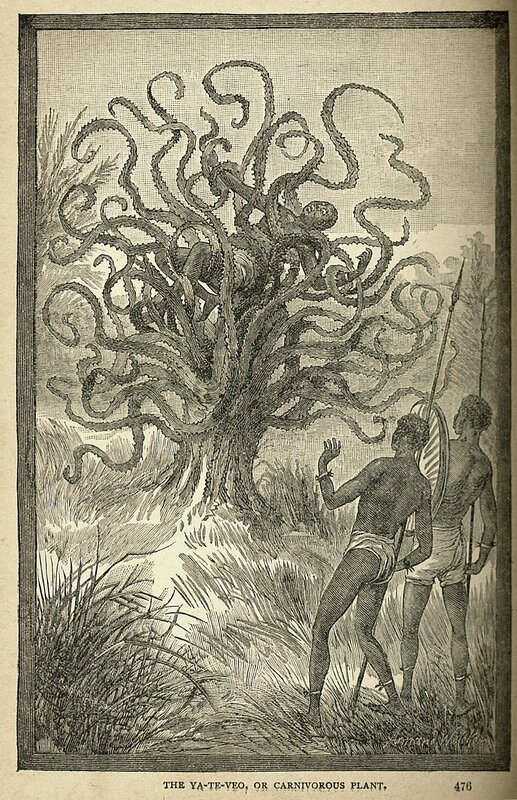 After forcing one of their women into the tree, the Mkodo and Carl Liche watched as,” the slender delicate palpi, with the fury of starved serpents, quivered a moment over her head, then as if instinct with demoniac intelligence fastened upon her in sudden coils round and round her neck and arms; then while her awful screams and yet more awful laughter rose wildly to be instantly strangled down again into a gurgling moan, the tendrils one after another, like great green serpents, with brutal energy and infernal rapidity, rose, retracted themselves, and wrapped her about in fold after fold, ever tightening with cruel swiftness and savage tenacity of anacondas fastening upon their prey“. I suppose readers were intended to accept that there was nothing Herr Liche could do in the circumstances. Do not be alarmed. I can assure you that such plants are unlikely to be cleared by AQIS for introduction to Australian botanic gardens – and Steve Irwin’s media campaign for AQIS has probably dissuaded any carnivorous plant collectors who previously may have been inclined not to declare seeds or seedlings at Customs! Originally published in The Adelaide Review on 21 December 2007.